What are the benefits of structured cabling for offices? All companies need a good communication system to support services such as WAN, LAN and ISDN. Your IT infrastructure should not only be strong and secure, but should also adapt to the ongoing changes in your business. 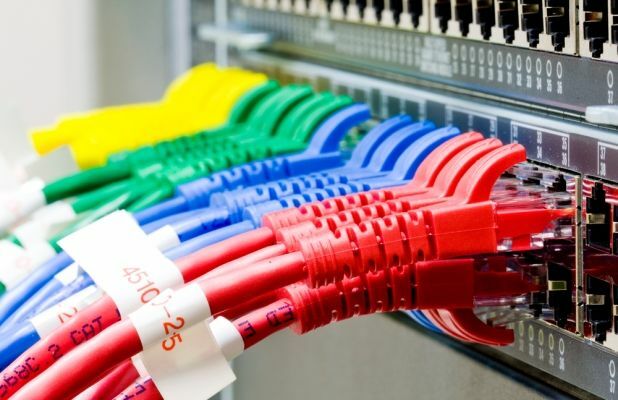 Read on to find out how structured cabling could improve your business. Simplicity – No messy wires as multiple wire systems are replaced with the structured wiring system. This makes the infrastructure much easier to manage. Increased data speed provides faster transmission assisting with overall business productivity. Supports Future Upgrade — Structured cabling is a forward-thinking technology. If your business is planning to stay around, then structured cabling is a great investment for the future. It allows for efficient changes and upgrades so all future moves & rearrangements can be can be implemented with no fuss. It can also carry a very high bandwidth, which means it won’t become outdated in only a few short years. Flexibility – Employees can plug in and continue working from wherever they are in the office. Cost-Effectiveness — A structured cabling system will survive all other networking components with only minimal upgrades required. It reduces power, cooling usage and cost. A properly designed and installed cabling system provides a cabling infrastructure that delivers predictable performance as well as has the flexibility to accommodate moves, adds & changes, maximises system availability, provides redundancy and future proofs the usability of the cabling system. I hope this information has been useful. To find out more about how structured cabling could benefit your business, please contact us on 0800 505 3350 and one of the team will be happy to help. Alternatively, you can visit our Network cabling for offices page which has lots of useful information and you can even fill in a Quick Quote to get an idea about costs.